NSWCA Commissioners received an education and updating about recent changes in the Freedom of Information Law (FOIL) from FOIL maven Robert J. Freeman. Mr. Freeman is the Executive Director of the New York State Committee on Open Government. Mr. Robert Freeman has worked for the Committee since its creation in 1974 and was appointed Executive Director in 1976. Every New York State or municipal department, board, bureau, division, commission, committee, public authority, public corporation, council, office or other governmental entity performing a governmental or proprietary function is subject to the Law. Each of the aforementioned governmental entities is an “agency.” Courts are outside its coverage but often must disclose records under other provisions of law. The State Legislature is covered by the Freedom of Information Law, but is treated differently from agencies generally. Private corporations or companies are not subject to the Freedom of Information Law. The intensive training session is part of the ongoing NSWCA Training Series. 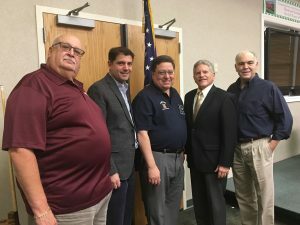 The session was held at the Westbury Fire Department to accommodate the large turnout which also included District Superintendents and employees. Left to right Commissioner William Schuckmann (Hicksville WD), Commissioner Michael Rich (Oyster Bay WD), Commissioner Andrew Bader (Plainview WD), Mr. Robert Freeman, Commissioner Kenneth P. Wenthen Jr.
Mr. Freeman He received his law degree from New York University and a BS in Foreign Servicrom Georgetown University in Washington, DC.